This large seabird is black and white weighing around 3 lb and has a large head and a wingspan of 6 feet. It is found only on Christmas Island, a small island in the Indian Ocean south of Java. Females are slightly larger than males and have pink, sharp conical bills. Male's bills are gray in color. Their necks are long and thick with strong muscles. Their eyes are located on each side of their bills and are oriented toward the front, giving them excellent binocular vision for fishing from the air. Little is known about the Abbott's Booby's behavior but they appear to be very social and have been seen in large colonies located on cliffs. Diet consists of fish and squid. During courtship the booby's use a deep and loud call. 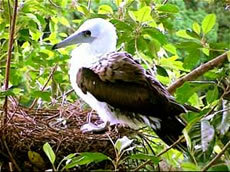 Little is known about their breeding behavior, but the Abbott's booby is said to be the only species of gannet to nest on the top of trees instead of on the ground. Females give birth to one egg and incubate it for 42 to 55 days. Both male and female care for the eggs. The hatchling depends on the mother for six to eight months. The main threat to the Abbott's Booby is loss of habitat through forest clearance. 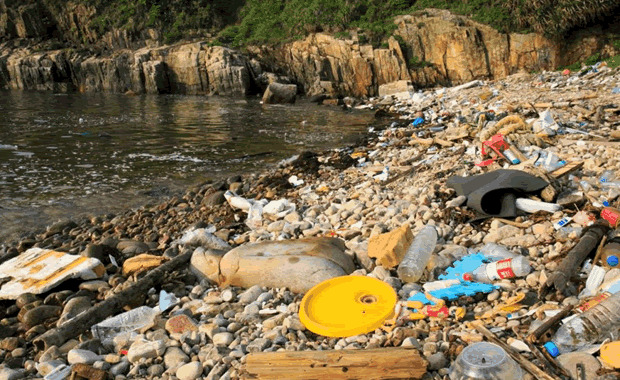 The current population is believed to be less than 2000. Copyright Notice: This article is licensed under the GNU Free Documentation License. It uses material from the Wikipedia article "Abbott's booby". Glenn, C. R. 2006. "Earth's Endangered Creatures - Abbott's Booby Facts" (Online). Accessed 4/21/2019 at http://earthsendangered.com/profile.asp?sp=42&ID=4. Need more Abbott's Booby facts?